Emily Carr is one of those heroic early 20th century artists who should escape attention no more. It was her singular vision to document the magic of the British Columbian wilderness and to be the very first artist who recognized and painted the magnificence of First Nations’ peoples’ totems that existed throughout British Columbia and beyond. She got no help from family – she formed herself. She was born in Victoria, British Columbia, Canada in 1871. The Vancouver Art Gallery has called Emily Carr “the most important BC artist of her generation”. She, along with Tom Thompson, David Milne and the Group of Seven were the most important Canadian artists of the first decades of the twentieth century. (The Group of Seven, 1 formed in 1920, is well-known as an organization of self-proclaimed modern artists.) All of these artists together transfigured the “Canadian Shield,” the dense, northern boreal forests and endless lakes, into a transcendent, spiritual force. Most of these artists were frustrated with the conservative nature of much of Canadian art, as the European Impressionists were similarly frustrated with the French Salon of mid-nineteenth century – the Impressionists preceding Canadian and American artists with their advance of Modernism. Contemporary, internationally famous artists, like former Montréaler Peter Doig, owe their oeuvre to these early Canadian pioneers who wedded mysticism to modernism with rich chroma, tactile paint handling, and lyrical, dynamic and simplified forms. Overall, their influence on contemporary landscape painting in particular cannot be overestimated. Only twenty after Emily Carr was born in Canada, Charles Burchfield was born in 1893 in Ashtabula Harbor, Ohio; shortly thereafter, the family moved to Salem, Ohio and Burchfield graduated from the Cleveland Art Institute. 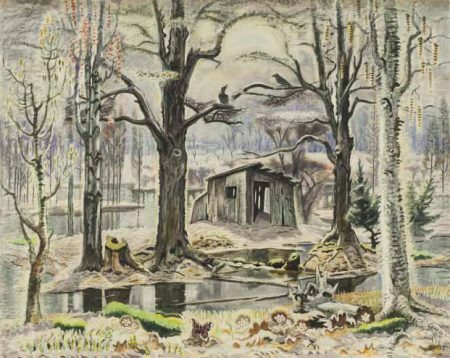 Like Carr, Burchfield developed a visionary landscape painting style. Like Carr, he put special emphasis on watercolors: Two visionary artists living far apart in neighboring countries never met except in their shared mystical visions of nature. In 1929, the Frank K. M. Rehn Galleries in New York City began representing Burchfield, so Burchfield was able to leave his wallpaper design job to paint full time. Burchfield had a solo exhibition in 1930, at the Museum of Modern Art in New York, Charles Burchfield: Early Watercolors 1916-1918. It is remarkable that an artist was featured in a solo exhibition at MOMA with exclusively watercolor paintings. He was included in the Carnegie Institute’s The 1935 International Exhibition of Paintings, in which his painting The Shed in the Swamp (1933-34) received an award. In December 1936 Life magazine declared him one of America’s ten greatest painters in its article Burchfield’s America. His prominence and continuing influence should be acknowledged too. What they have in common is their respective Modernist/mystical ways of representing nature. Carr presents dense enveloping forests. 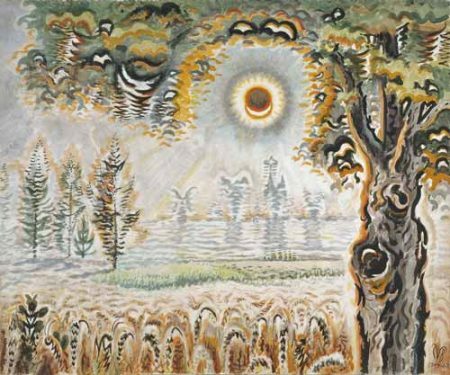 Burchfield presents radiating suns in luminous skies above humble houses, to give two examples of their subjects. Both favor dark palettes, as say compared to Matisse who represented the landscapes of the south of France or Morocco in Fauvist lime and leaf greens, oranges, areola yellow, cobalt violets. Both Carr and Burchfield, especially Burchfield, utilize a dark or black outline. This contributes to the haunting and mystical quality of their work. But the overarching feel of their paintings must come from a deep well of inner conviction about nature. Having these two unique artists in permanent collections is marvelous; Carr’s paintings at the Audain Museum of Art in Whistler, Canada and the Vancouver Art Gallery, Vancouver, while Charles Burchfield’s paintings can be seen at the Burchfield Penney Art Center-SUNY at Buffalo State University. These permanent collections offer up for the viewer a wonderful overview of each artist. 1The original Group of Seven included Franklin Carmichael, Lawren Harris, A.Y. Jackson, Franz Johnston, Arthur Lismer, J.E.H. MacDonald and F.H. Varley. They befriended each other in Toronto between 1911 and 1913. All photographs by author with permission or where image source is noted. Cynthia Kukla is an artist and Professor Emerita living in Cincinnati, OH. Two visionary artists living far apart in neighboring countries never met except in their shared mystical visions of nature. 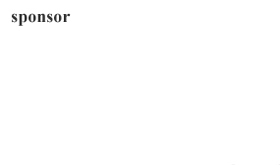 I love this sentence in your review. Wonderful descriptions, analysis and history of the artists. I enjoyed the images you used to illustrate their work. It certainly is metaphysical and and inspiration! 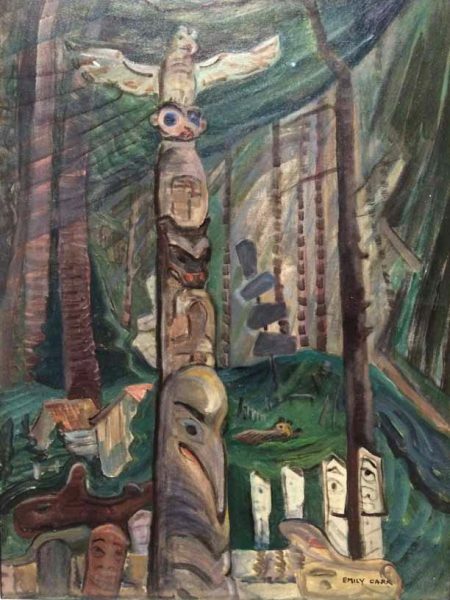 We so are lucky to have Emily Carr on view on the permanent collections of the Audain Art Museum and the Vancouver Art Gallery. 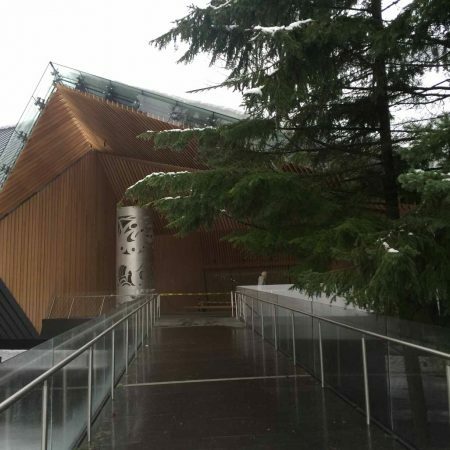 Thank you for visiting us in Whistler and we look forward to continuing to showcase art such as this. BC truly is home to mystical visions of nature in its art.